Lauren Sparks recently found me through Compassion International bloggers and I’m glad she did! I’m just getting connected with her, but she’s already been an encouragement to me. And I get the feeling she will be to you too as she shares a piece of her story with you here today. I would like to forget 2017. I certainly don’t care to dwell on it. In February, my husband lost his job with a company he had worked for more than 26 years. In March, I received a breast cancer diagnosis that resulted in four surgeries, chemotherapy and infusion treatments that are still ongoing. My daughter, who has a severe seizure disorder, earned her first ambulance ride and a hospital stay to stabilize 14 hours of clustering seizures. While running some tests, doctors discovered a hole in her heart that we have now scheduled for surgical correction. And, although my husband quickly secured additional employment, the job did not last and he found himself without work a second time. To cap off the year, my purse was stolen – my iPhone, iPad and, credit cards with it. To say we are longing for God to do a new thing seems understated. The Isaiah passage states that God will give drink to his people so they will proclaim His praise. And He will refresh my family and bring us something new for the same reason: Because we will give Him ALL the glory. My husband’s next job won’t come to him because he is a born servant leader – although he is. My cancer isn’t in remission because I have brilliant doctors – which I absolutely do. 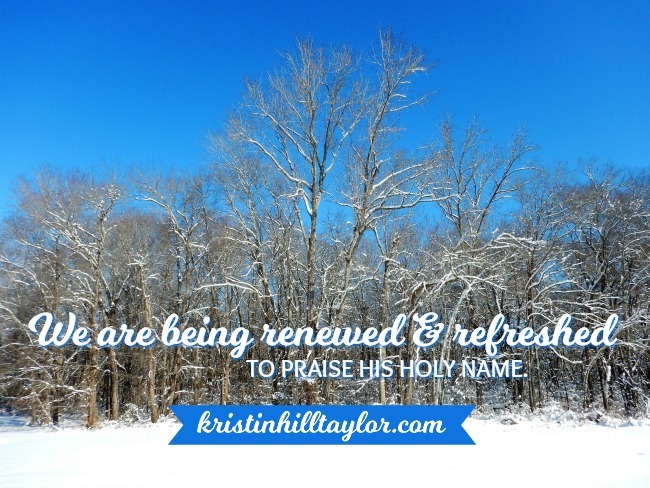 renewed & refreshed to praise His holy name. Isaiah testifies he “made a way through the sea, a path through the mighty waters.” He “drew out the chariots and horses, the army and reinforcements together, and they lay there, never to rise again.” He “blots out” my transgressions, for His own sake, and remembers my sins no more. “The wild animals honor” Him, and so do we. We praise Him now, even though the waters feel more rough than refreshing. We thank Him for all the ways He is sustaining us. We worship Him because NO MATTER WHAT, He is good! And even if the new thing He is doing in us looks different than we had planned, we will tell of His excellence. 2018 is a victory story already, because we call on His mercies. We run to Him and find rest. We wait and watch in expectation of all that He is doing. God is doing a new thing. And we rejoice. Lauren Sparks is a wife, mom of three, grandmom of four, fitness instructor, and grateful believer in Jesus Christ. 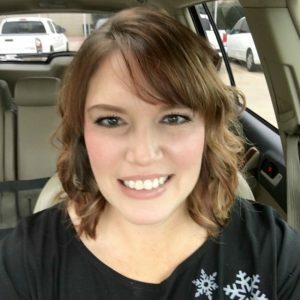 She shares the ups and downs of the faith of a special needs mom at The Sparks Notes blog. I also wanted to make sure you saw the new format to my monthly wrap-up posts that I introduced yesterday. I’m looking forward to sharing Stories from the Porch end of each month. Lauren so sorry 2017 was such a hard year. 2018 has started off hard here, but nothing like your year. Love your focus and why you know 2018 is a victory story – His story. Victory story – I like that, Debbie! Thanks for being here. May we remember that the One who makes all things new is sitting on His throne – in complete sovereignty over each of our lives. Blessings today be upon you and your family! Thanks so much, Kristin, for sharing Lauren’s amazing story and even more amazing faith. You’re welcome. I’m glad you’re here, Michele! Excellent post, Lauren. Praying 2018 is a much better year for you. Kristin, thanks for sharing the Compassion bloggers link. I sponsor a child through Compassion but I was unaware of the blogging opportunity. Blessings to you! Compassion Bloggers has a Facebook group where there are writing prompts and opportunities to support Compassion with our words. I’m glad to share that with you! Thanks for being here, Sarah! Lauren’s story is one that makes me extremely humble and grateful. We all go through bad seasons but it does seem her family has had a double or triple dose. I’ve whispered prayers for them. I know she appreciates those prayers. What an encouraging testimony, Lauren. Thank you for being willing to share. I’m ear-marking your blog so I can come back and see all that God is going to do for you and your family in 2018!! I really do enjoy these chats on the front porch! Thanks for joining us on the porch, Jennifer! That Lauren & her husband are the real deal. She is writing about a faith they live out everyday based a God who is the truest thing to tie ourselves to in any storm. Thanks Lauren, for sharing your lives with us!!! I love hearing that and am so glad to have this peek into her faith. Thanks for being here, Heather!